Diaper Cake is a great baby shower gift and a gorgeous centerpiece for the Peter Rabbit themed baby shower. Can also be used to welcome your special baby in the hospital room. 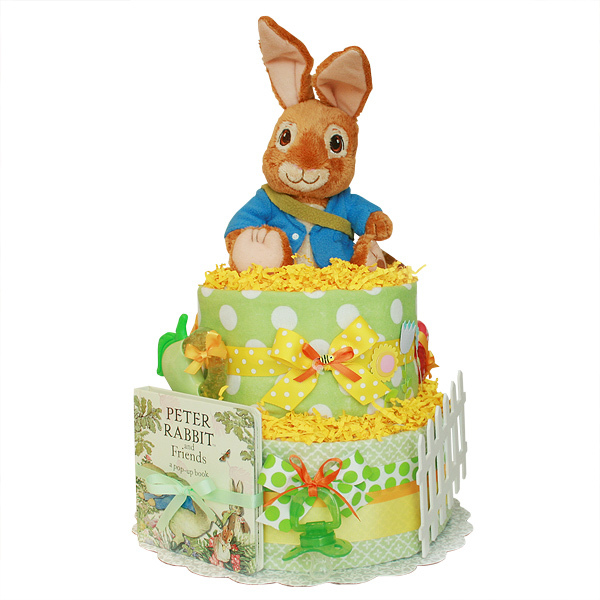 Two tiers Peter Rabbit Diaper Cake is made of 39 Pampers Baby Dry diapers size 1 (8-14 lbs.) and Huggies Little Snugglers size 2 (12-18 lbs. ); two flannel receiving blankets 100% cotton; one plush Peter Rabbit toy; two Peter Rabbit books; one pacifier; three teethers; wood and scrapbook embellishments. Decorated with yellow crinkle paper.